Weight gained: As of last Thursday, we were at 21 pounds gained. However, after going majorly out of control this weekend (I had a cold and couldn’t taste food for 3 days last week–NO FUN)…who knows. 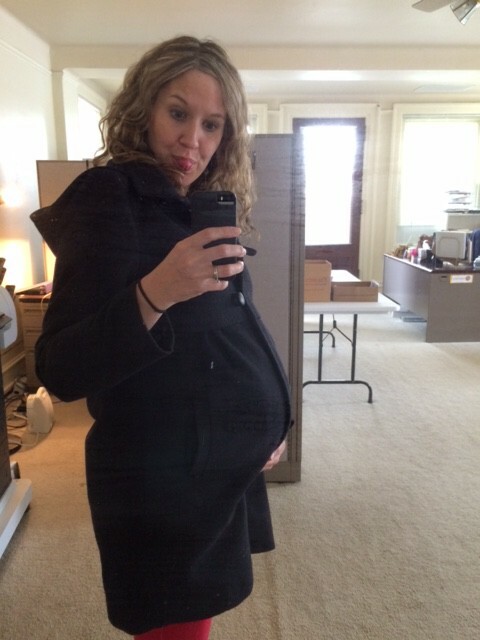 According to most websites, the baby should be between 4.5-5 pounds at this point. It’s crazy to think how big he/she is! Tired. A lot of it is due to being sick, and this week I’m feeling so much better on that front. I’ve been taking iron supplements (my doctor encouraged me to do so at my 28 week appointment, since my iron was low…like usual), and I *think* I notice a difference in my energy with that. Quite a few Braxton Hicks contractions. Pretty sore, especially my hips. When I stand up, I feel like the baby is RIGHTthere. It’s uncomfortable to breathe at times, so I’m definitely looking forward to when this baby drops! Food Cravings: About the same here–I can’t get ENOUGH sweets, with Reese’s “eggs” (and “hearts”…did you know they make Reese’s hearts now??! ), cookies, and ice cream being my favorites. Also, Mexican food. Sleep: I had some trouble sleeping last week due to my cold and just being congested, so I slept on the couch a couple of nights since I could sleep with my head elevated. That seemed to help a LOT. Other than 1-2 trips to the bathroom a night, I’m sleeping great! Miss Anything? Being able to breathe normally…just a wee bit. Fun and/or Interesting Things from the Week: I’m starting to pick out a few things for the nursery, which is very exciting. The plan is to move everything on the walls in Kate’s current room into her “big girl” room, and to replace everything with more “gender neutral” things. 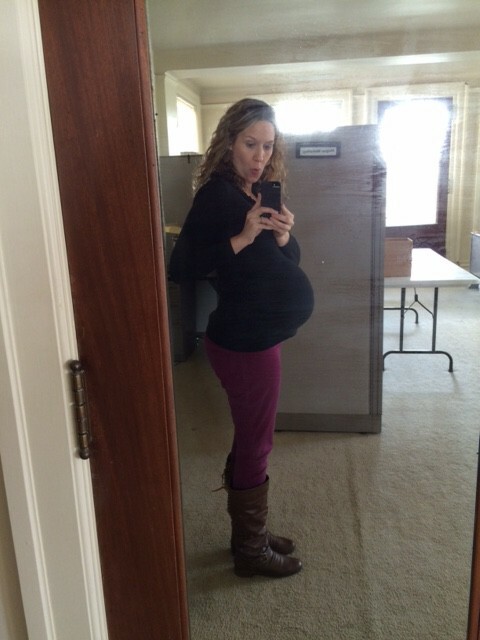 Don’t ask me what will happen when/if Baby #3 comes along….I have no clue who will share rooms! Happy or moody most of the time: Pretty happy, just trying to get my energy back a little bit. We went to Chicago last weekend for a very quick trip, and it’s CRAZY how much it took it out of me (it also could do with not sleeping as much as I normally do…). New Baby Items: None really, other than some diapers I got on sale (thank you, Target!). I’ve been looking for a take-home outfit and will probably get those (boy/girl) in a month or so. That’s when it really gets real! Looking forward to: I’m excited to hunker down the next 6-7 weeks and try to get as much done at home as possible. I LOVE NESTING. For the procrastinator in me, it’s pretty much the best thing ever. We just painted our downstairs bathroom, and the laundry room is next. Eventually we’d like to replace the laminate floor with ceramic tile, but that probably won’t happen for a bit. I’m trying to get as many house projects done now as I can. With 2 kiddos under 2 and possibly graduate school looming, I KNOW I won’t want to tackle these things in a few months!